Storms Can Cause Significant Damages To Your Roof. As they roll in, storms can leave your roofing system and property in disrepair. Your local roofer can get your roof at its best by repairing roof storm damage quickly. At ECO Commercial Roofing, we provide you with roof services and storm damage roof repair in Texas, Louisiana, and Mississippi, TX. Licensed and expert roofing contractors are ready to commence your repairs when you require them and work on your availability to get your roof system back in shape. Your roof system repairs are completed with top-notch materials and roofing practices, taking your specifications and requirements into account. 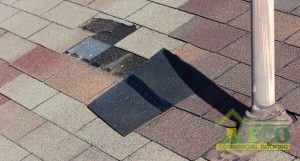 Want to get started on your storm damage roof repair? Give ECO Commercial Roofing a call at (833) 200-0571 to speak with our roofing experts today! Your roof system can experience different kinds of damage that depend on the storm. Severe winds and hail can bore into, dent, and pull materials from your roof system. Your roof can experience leaks which affect your property, or, at worst, a complete loss of the roof when it becomes damaged by large debris. Even with severe damage, it is urgent that you have your roofing system repaired before the next storm and back to protecting your property. Hail Damage Hail can damage your roof beneath the surface, and leave you vulnerable to water damages. Wind Damage Wind is one of the most destructive forces to your roof, and even has the potential to tear off parts of your roof. Insurance Claims If you need help with your roof insurance claim, or experts are here to help, with years of experience. Get the protection you need from your roof system when you have our roofing contractors perform roof storm damage repairs. First, we complete a comprehensive inspection to detect any damage the storm could have caused. All information is relayed to you by our roofing contractors who work with you to restore your defense. All of your questions are answered by our team and we will make recommendations on your roofing choices to better your defense. As your happiness is our goal, we work until the roof system meets your specifications. When you need a roofer that will work with your insurance company, contact ECO Commercial Roofing. Our team works with you and your insurance company to execute repairs and can even supply a roofing inspection and report to add to your claim filing documentation. During the repair process, we always keep you briefed and up to date on your roofing to ensure your satisfaction. For your roof storm damage repair in Texas, Louisiana, and Mississippi, call (833) 200-0571 today!